Within this mammoth 353 slide deck, the Kleiner Perkins venture partner brings together the best research and latest figures on topics including global Internet trends, online advertising, interactive games, the cloud and healthcare technology. In our post, we’ll focus on global internet trends and online advertising and ecommerce, but you can browse the full deck if you’re interested to learn more about the other components of the research. There are several slides dedicated to mobile within the full presentation but, the most compelling statistics concern the huge upsurge in mobile internet usage. According to the Report, the average US adult now spends 3.1 hours per day on the mobile internet (out of 5.6 hours internet use per day in total). This has increased by two hours per adult per day since the 2011 measurement. Last year, mobile internet use was measured at 2.8 hours per day. 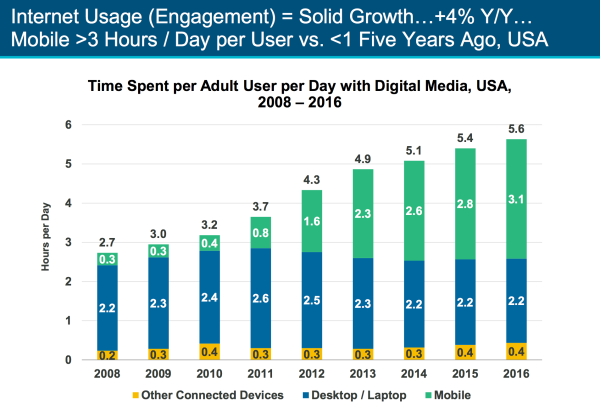 Desktop use hasn’t declined by the same amount, it has remained steady at 2.2 hours per day since 2014. While there has been much talk of the importance of mobile first and Google’s mobile index, these figures suggest consumers are still desktop device users and therefore as a marketer, you’ll still need to consider the time spent on desktop devices as well as maintaining your focus on mobile. Another area where mobile exceeds desktop – and by some margin – is in ad spend. Mobile ad spend is up 22% year on year and doesn’t look set to slow anytime soon. The Report predicts that spend on mobile will eclipse total ad spend on TV within the next six months. 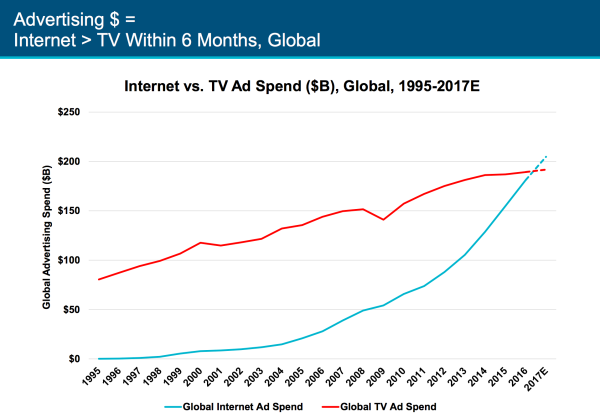 This presents marketers with an interesting conundrum; compete in an ever more crowded ad space (which means spending more money) or make the switch back to desktop or even offline to TV - which is losing market share to online. Google may be the name that springs instantly to mind when you think of online ads but, the Mary Meeker Report shows that there’s actually a duopoly with Facebook and Google accounting for more than 80% of online ad growth – and counting. 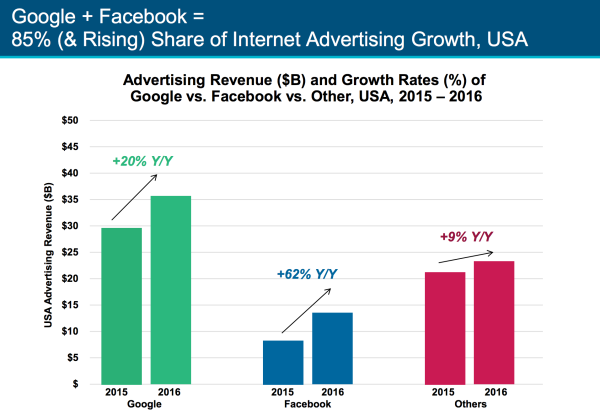 While Google tracked a 20% year on year growth, Facebook has recorded an explosive 62% year on year growth. 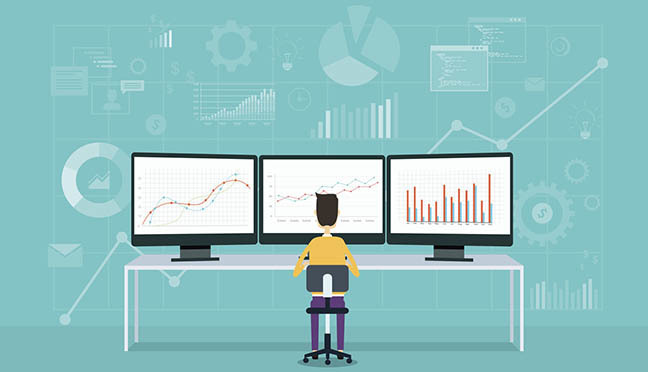 The report notes that more data and more impressions allow both sites to improve targeting options for advertisers, making it even harder for other platforms to get a look in. As an advertiser this means you are faced with a choice; you can use Facebook and/or Google, with its superior targeting systems and accept that comes at the cost of greater competition and higher prices, or try one of the other platforms. But beware, they are slower growing and lack the users, data and numbers that allow for the more sophisticated developments going on at Google and Facebook. Facebook, Google and interestingly, Snap are highlighted as responding best to advertiser demands for better targeting, improved reporting and enhanced measurement of what works, and what doesn’t. 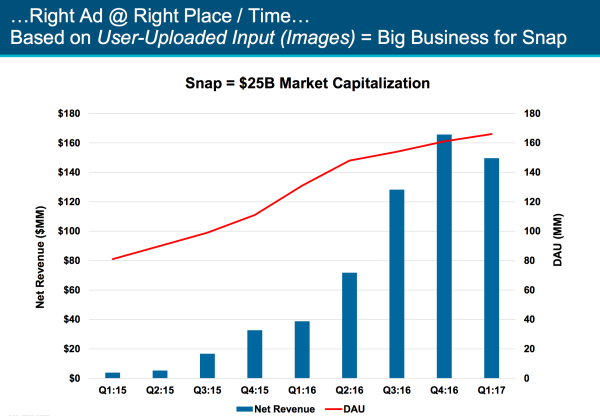 Being in the right place at the right time is the holy grail of advertising and Snap seems to be getting it just right. It’s turned user image sharing into a massively popular ad business, tracking up exponentially with a sharp incline in revenue in the last two years. This is a platform to potentially consider if you’re already priced out of Google and Facebook and have a very visual product. 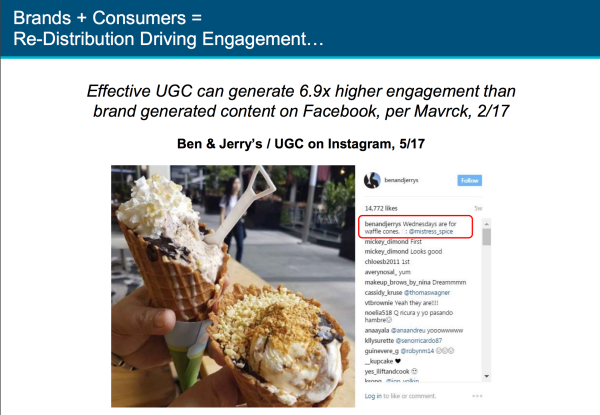 The success of Snap is part of a wider trend, with content created by users and influencers noted to perform much better than ‘stodgy’ brands. The takeaway? It’s time to get your influencer marketing campaign wheels in motion. Voice search is looking likely to be the next big thing, with 20% of all mobile searches now conducted with voice. Look out for our post on how to optimize for voice search coming soon. If your brand operates in an established industry, such as pet care, beauty or fashion, get ready for some disruptive competition. 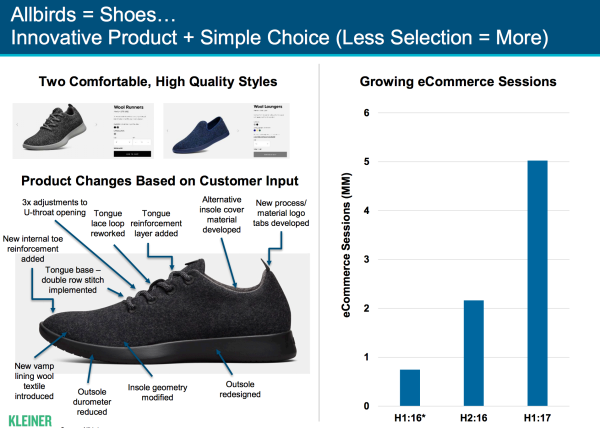 According to the Trends Report, new brands are using content marketing, community building and narrow product selections to make waves, giving older industries something new to think about. If you’re guilty of falling behind the curve in a well-established sector, it’s time to up your digital marketing approach and rethink your entire approach to owned media. Ecommerce grew 15% year on year, with the rate of growth accelerating once again. 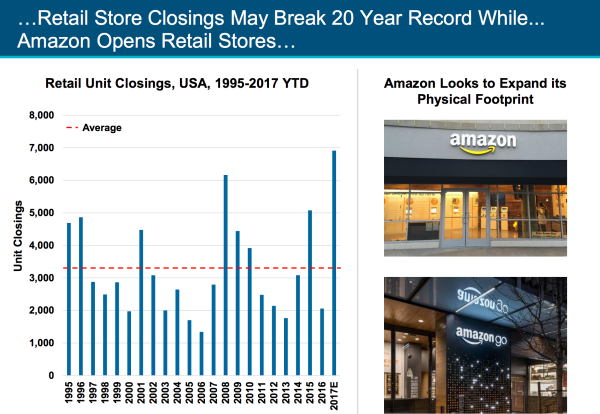 The increase in online retail sales has had consequences for bricks and mortar stores, with Meeker reporting many location closures for big brands including CVS, RadioShack and Macy’s. 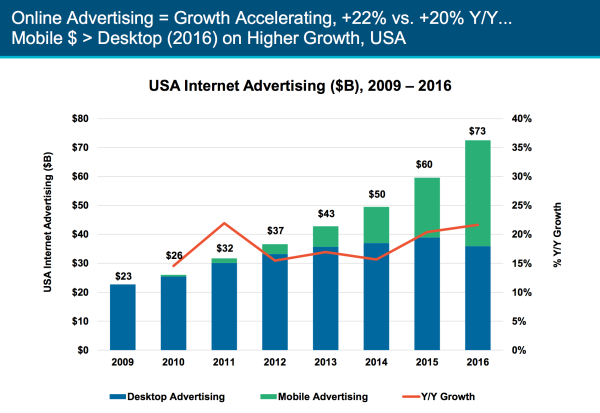 The 2017 Mary Meeker Internet Trends Report offers a number of fascinating insights, highlighting the ad dominance of Google and Facebook but also showing that desktop isn’t dead - despite the mobile surge. Do any of these trends surprise you? Share your thoughts with us in the comments.